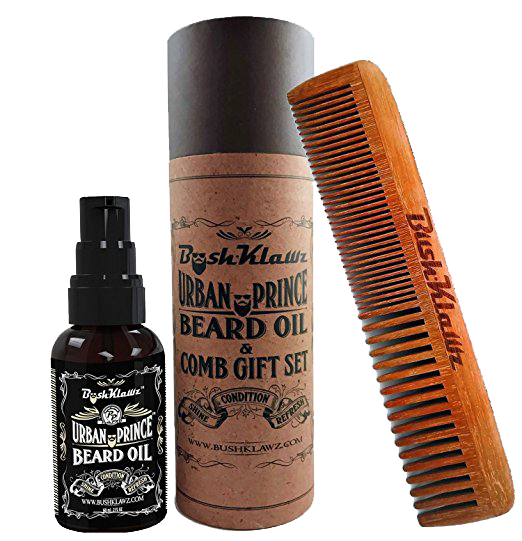 PERFECT GIFT FOR THE BEARDED MAN - Packaged in an attractive gift box, he'll be impressed with the quality and results. You'll be impressed with the scent and soft, well-groomed results. GREAT FOR ALL BEARDS & HAIR - Long or short beard, straight, curly or out of control, our Beard Balm and Pocket Comb combo set will conquer them all and make short work of any strays. PERFECT MEN’S POCKET BEARD COMB FOR ALL BEARDS, MUSTACHES & HAIR - Perfect for detangling, shaping, styling, grooming, and applying your favorite beard oil or balm. The 4 sided teeth ensure that you can attack each hair straggler with precision in a single stroke. FINE, WIDE & SIDE TEETH - This comb is perfect for both short, medium, long, thin, thick, curly, straight or any type of hair in between. It combs and grooms from every angle of every hair type to keep you looking effortlessly groomed. Just Spray, give it a good tousle with your fingers and you're ready to GO. Instant Shine & smoothness! Formulated with an Argan oil base, gives your hair and beard a natural, manageable shine and softness. Give your beard and hair, the "special" shine and conditioning it needs when it matters. It conditions and maintains natural moisture. 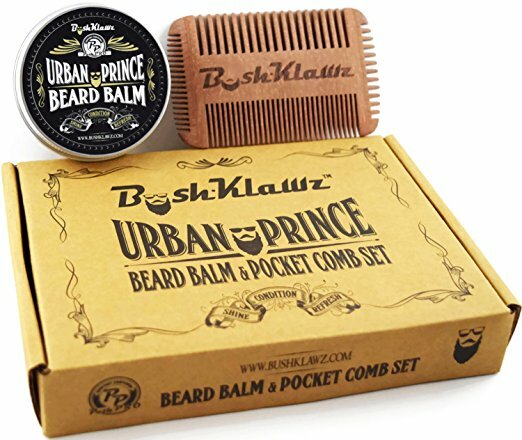 Specially formulated with BushKlawz "Urban Prince" scent, will leave you irresistible. Bar NONE the best smelling Beard Balm. Ideal blend of Shea Butter, Yellow Beeswax, Jojoba Oil, Argan Oil, Sweet Almond Oil, Apricot Oil, Castor Oil, Emu Oil, Tamanu Oil and Vitamin E are hands down the best stuff for your face muff. It's the foundation of our beard balm, a magic mix that smooths, conditions, and softens your scruff like no one's business. Are you tired of all the cheap weird incense and plant juice smelling beard oils? So are we! We have formulated a special blend of natural carrier oils to keep your Man Mane looking its manly best and smell Magnificent! Smells absolutely awesome! BushKlawz Full Size Comb is perfect for both short, medium, long, thin, thick, curly, straight or any type of hair in between. Made from pure Pearwood, BushKlawz comb's are designed and crafted so that you are the master of your hair. No static buzz frizz here.